This Father’s Day, it’s time to go all out and prove how much you care about dear ole’ Dad. Guarantee an unforgettable holiday with premium saltwater gear from Rapala®, a brand with an 80-year history of making memories on the water. 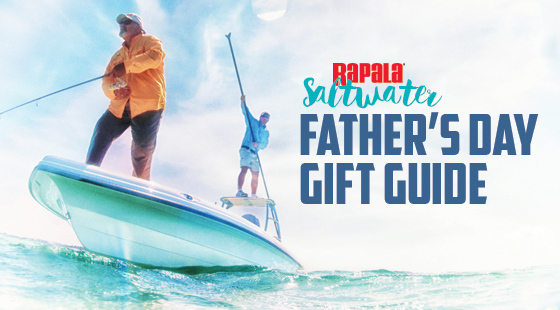 Whether it’s a hot new bait sure to have Dad rippin’ lips at record rates, or functional and comfortable apparel to keep him stylish on — and off — the water, Rapala and Respected Rapala Brands offer a seemingly endless variety of sure-fire gift ideas for the saltwater enthusiast. This Father’s Day, don’t hold back, show the Old Man your appreciation by hooking him up with best-in-class gear his buddies will envy. Hand-tuned and tank-tested to perform to the highest standards right out of the box, the Rapala® Clacklin’ and X-Rap Magnum® are ready to help Dad hook the biggest fish in the sea. The Rapala® Clackin’ Magnum® combines an attention-grabbing clackin’ cadence rattle with Rapala’s tried-and-true wounded minnow action to give Dad a bait that big fish simply can’t ignore. Perfect for trolling slow or fast, this versatile lure’s deep-diving lip makes it easier than ever to quickly reach the desired depth, keeping the bait in the “strike zone” longer and upping the odds of landing a lunker. The Clackin’ Magnum comes in 10 eye-catching color patterns and is ready for action with extra tough VMC® Treble Hooks. Built for battle with aggressive saltwater species, the X-Rap® Magnum® features a massive diving lip that plunges the bait into the depths with ease. Its sleek design allows it to be fast-trolled at speeds up to 13 knots, making it a great choice for targeting behemoth fish worldwide. Boasting a textured, translucent body and internal holographic foil, when Pops ties on the X-Rap Magnum, he’d better have a buddy ready with the net. Available in four sizes and more than a dozen finishes, this lure will be the hero of Dad’s next fishing story. The perfect gift for saltwater anglers who dream of epic battles with the world’s most lively game fish, Williamson’s most popular hard baits, the Popper Pro®, Surface Pro® and Speed Pro Deep®, will perfectly fill out Dad’s tackle box. A small package that promises massive strikes, the Popper Pro’s versatile design allows the Big Guy to fish a variety of proven techniques — pop it on top of the water, slash and stall, or walk the dog — for a presentation that will heat up the bite in any scenario. Featuring an in-line hook designed for optimum swimming action, point exposure and hook set, the Popper Pro comes in seven life-like color patterns and two sizes for targeting coveted pelagic game fish. Thanks to its deep-diving lip and self-centering “Auto-Tune” line tie system, the Speed Pro Deep is able to rip through the water at speeds up to 15 knots, with optimum action at 6 to 10 knots. It’s smooth swimming action sets the bait a step above lesser lures and enables anglers to fish it on lighter line — even with a light drag setting — for a more intense fight. The fast-moving bait is available in two sizes and seven enticing color patterns. The Speed Pro Deep comes ready to fish with rugged VMC® Heavy-Duty Perma Steel® Hooks. Utilizing the hard-won knowledge of a lifetime spent pursuing the world’s largest gamefish, the experts at Williamson offer must-have accessories ready to handle the unique challenges of offshore fishing. 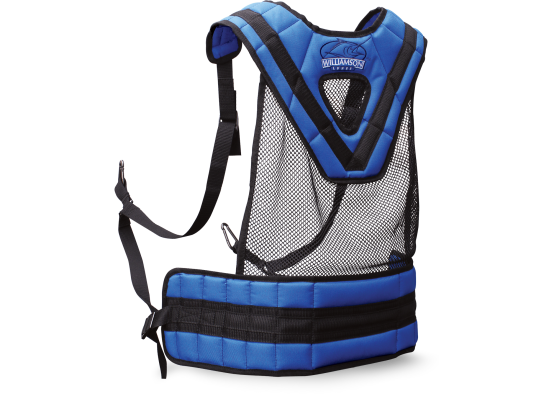 This Father’s Day, ensure Dad’s ready to reel in his next trophy with the Williamson Fighting Shoulder Harness. Built with an ergonomic and comfortable design, the Fighting Shoulder Harness will make sure Dad’s prepped for fierce battles with big fish that tend to wear out inexperienced anglers. Meticulously crafted, the harness’ cushioned nylon construction with breathable mesh inserts offer ideal ventilation for long days under the hot sun. It also boasts an ultra-strong nylon webbing with double-reinforced stitching to guarantee it will stand up under pressure time and time again. Williamson fillet knives will help Dad make easy work of even the most daunting filleting tasks, exceeding his expectations as a serious saltwater fisherman. Available in three versatile models — the Curved Fillet Knife, Straight Fillet Knife and Slim Fillet Knife — each Williamson knife features an ergonomically designed co-molded handle to provide a comfortable, relaxed grip for fatigue-free filleting. Every Williamson fillet comes with a manually finished, rust-resistant blade honed by the skilled veterans at Marttiini, a legendary blade manufacturer that has produced Rapala knives since 1928. The knives’ world-renowned razor-sharp edge promise to take the hard work out of cleaning any saltwater species, from delicate flounder to big Yellowfin Tuna and every fish in between. Dad’s saltwater game will never be the same once he unwraps a premium-quality Williamson fillet knife this Father’s Day. Tough enough to handle the intensity of saltwater fishing, Sufx® 832 Advanced Superline® is the strongest, most durable small diameter braid on the market, making it perfect for the dad that demands the best from all his gear. Leveraging R8 Precision Braiding and state-of-the-art fiber technology, Sufix 832 Advanced Superline achieves superior strength, roundness and line consistency that puts conventional fishing line to shame. Its patent-pending construction of 8 fibers (7 Dyneema® plus 1 GORE® Performance Fiber) and 32 weaves (pics) per inch is the key to the braid’s unmatched quality. GORE® Performance Fibers improve abrasion resistance, increase casting distance and accuracy and also reduce line vibration. Sufix 832’s Dyneema® fibers provide high strength and sensitivity, hydrophobic water-repellent protection and allow for a small diameter. Available in five colors and up to 80-pound tests, this line is sure to keep trophy fish hooked during even the most epic encounter. This Father’s Day, instead of another collared shirt that will get lost in the closet, get Pops new threads that combine comfort, style and functionality. Rapala®, Williamson™ and Sufix® brands have a wide range of apparel that can match the style of every dad. For a casual look, Pops can don the new Rapala Lucky Lures Laced Hoodie and classic Patch Legacy Hat. Long-sleeve tees from Sufix and Williamson provide a stylish, yet comfortable look for Dad to rock for his next angling adventure. With overnight shipping available (if ordered before 1 p.m. CDT), you’ll have these great gifts in-hand in no time. Visit Rapala.com for pricing. This entry was posted in News, Rapala, Sufix, Williamson and tagged 832 Advanced Superline®, Clackin’ Magnum®, Fighting Shoulder Harness, Marttiini, Popper Pro, Rapala, Saltwater Fillet Knives, Speed Pro Deep, Sufix, Surface Pro, Williamson, X-Rap® Magnum®. Bookmark the permalink.